Traditionally, students are first exposed to computer science (CS) in high school, if they are fortunate enough to attend a school that offers it. Only 6% of all students will take CS while they are enrolled in a SFUSD high school. Unfortunately, participation among certain groups is even lower; females and minority students do not enroll in numbers representative of their proportion of the population. By beginning in the middle grades and with all children, we will normalize a discipline that has been long dominated by a selective group of the population. We expect that--as we expose all students to engaging, culturally relevant, and high-quality computer science instruction-- more will choose to continue pursuing CS, and these students will begin to represent our diverse student population. Ultimately, all children will learn computer science every year, from pre-kindergarten to twelfth grade. However, we recognize we cannot achieve this overnight. In 2015-16, we are piloting a new middle grades CS course at 12 schools, reaching about one-third of all 6th, 7th, and 8th graders in the district. We expect to reach nearly all sixth grade students in 2016-17. The primary goal of our pilot program is to learn how we can scale our CS curriculum and implementation method to additional grade levels and all 21 middle grades schools. We are working with SRI to externally evaluate our pilot and help us answer this question. Females, African Americans, and Latinos are vastly underrepresented in the technology and computing workforces. Similar disparities exist at the collegiate level, and unfortunately, our current high school computer science course enrollment perpetuates these disparities. In our equity-minded pilot program, the middle grades students studying CS mirror the diverse student populations of our schools. Through this initiative, we are disrupting the trend of who traditionally accesses CS education and careers. Our curriculum is research-based and designed for the success of all students. Our first middle grades course was originally designed by computer science professors at Harvey Mudd College, as part of a National Science Foundation grant. 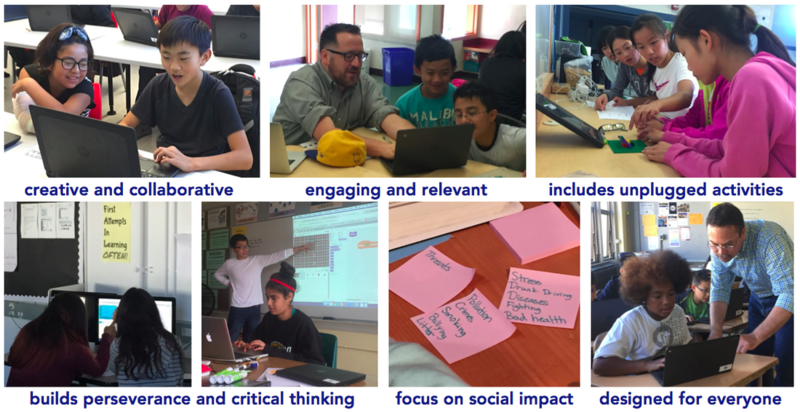 SFUSD has adapted and augmented to better meet the goals of our program. CS specialists will help to revise the curriculum throughout the course of the pilot. In this introductory course, students will learn the foundational concepts and skills of computer science (CS). They will transition from being the consumers of technology to the creators of technology, and they will explore how to use the power of computers to solve big, real-world problems. The course is designed to be fun, engaging, relevant, collaborative, and creative. Students will build their understanding of computing concepts using many unplugged activities and will apply their understanding through creative projects in the Scratch programming language, where they will learn to make animations, music, drawings, and games, as well as program robots in the physical world. Develop foundational skills and knowledge in computer science. ​Our 16 computer science specialists are AMAZING! We are deeply grateful for their hard work and dedication. 89% of students reported they enjoyed taking the class. 86% of students reported computer science is fun. There was a 25% increase in the number of students who reported they are very good at computer science. Nearly three times as many students reported they were interested in pursuing computer science careers.